This has turned into a tablet world. And why not? Consumers can use these nifty and highly portable devices to watch movies, surf the Web, listen to online radio and send and receive e-mail messages while on the go. It’s little wonder that tablet sales have eclipsed the sales numbers put up by traditional laptops. But that doesn’t mean that tablets are perfect. A lot of users have lamented that these particular devices falter when it comes to sharing screens with others. But this, too, is beginning to change, due to several high-end screen-sharing apps for iOS now on the market. Miguel Leiva-Gomez, a writer with the smallbiz technology Website, took a quick look at three of the best. Start using these apps and you’ll soon be sharing screens with ease, even on a tablet. Leiva-Gomez starts his review with join.me for good reason. To put it simply, it’s one of the best screen-sharing apps for iOS currently available. You will, however, have to pay for the program’s “pro” version to use it. After you cough up the monthly fee of just under $20, though, you’ll be able to share your screen with co-workers and friends with ease. The program also comes with such goodies as Internet calling, instant chat and file sharing. Leiva-Gomez says that this app will turn your tablet into a whiteboard with such features as multiple pages. Users can use images from their own libraries as the background of their whiteboard and they can make use of one of five different drawing tools. 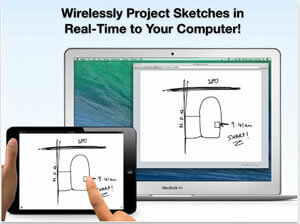 Users are also able to use Air Sketch to open PDFs. The program displays everything in real time, creating an environment well suited to collaboration. Though it’s a fairly simple app, that doesn’t suggest that Conference Pad isn’t also a powerful one. Leiva-Gomez writes that that this application is extremely promising with regard to zooming in on documents and PDFs. As he writes, users can perform this without sacrificing any image quality. The application also is an intuitive one, made to be easy for new users to master.